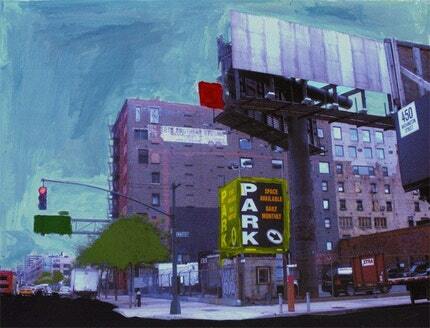 Many artists dream of coming to New York. The Big Apple has long been a mecca for painters, illustrators and sculptors--a city filled with some of the world's finest museums and amazing galleries; where even the graffiti can be beautiful and compelling. 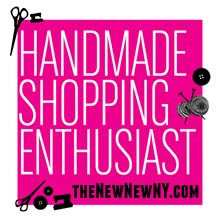 The NewNew York Etsy Team has several artist members who work in all different kinds of mediums. We spoke with two painters about some of the challenges they face as artists, and got advice from a third shop about a unique selling venue in Manhattan. Iris from Art by Iris and Lisa from PrismPop are Etsy artists and members of The NewNew York Etsy team. Lisa told us that one of the most challenging things about selling her art is what she terms "the blatant vulnerability". She explains: "To put something out there that is representative of yourself feels like walking into the world a little naked. It can be thrilling but not for the insecure. I have definitely gained greater confidence by creating art of my own - not hiding behind the label of a boss or company." Iris talks pragmatically about the challenges she faces in selling her art: "Up until recently my main venue has been selling mostly original paintings on Etsy (adding more prints daily). Selling original fine art has been traditionally reserved for galleries, who's curators know art and know their customer base and therefore can best match collectors with artists. The buyer can visit the gallery and view the art first hand, not just images of it. If the buyer knows the gallery owner and has a relationship of trust with them, he/she feels assured of the market value of the art. All these advantages are not available when selling art on Etsy, which makes it very challenging. On the other hand, there is the tremendous advantage for an artist who is initially unknown - of being able to reach a large audience they wouldn't be able to reach otherwise! The collector also enjoys the advantage of buying the art directly from a yet-unknown artist, at a fraction of the market price for original art!" We asked both artists about the ways that they promote their art. Iris is a mother of two and has the best of intentions to make use of all the technologies available for social networking--but finds it difficult to balance the job of promoting via her blog, flicker account, relisting on her etsy shop and the time it takes to create new pieces of art. Lisa told us that one way she promotes her work is by gifting her custom portraits to friends and family - this has led to a surprising amount of work; friends of theirs see it, admire it, and commission their own! She also has a blog where she features creative finds from the internet mixed with some self promotion. One unusual way some New York artists are promoting themselves is by taking it to the streets...literally. 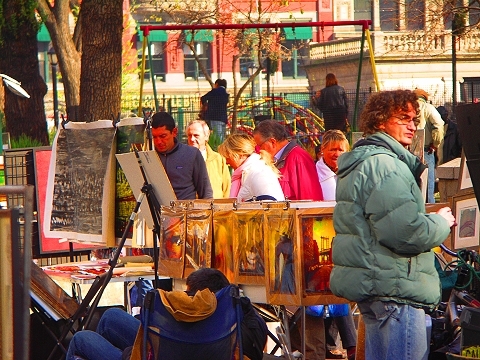 Union Square hosts an amazing outdoor art scene - filled with artists selling every style of art imaginable at all different price ranges. You'll find photography, prints, original oil paintings, portraits, illustrations, and every other imaginable form of artistic expression and get a chance to meet the artist behind the work! One NewNew Team member, Lu from Lu Crafts has had the experience of selling her unique items (including magnets and switchplates) at Union Square and shared her some tips with us. Asked how she started out, Lu told us: "I started selling in Union Square last summer, after I realized I could. I made it a point to talk to different sellers to understand the culture before I "set up shop." Saturdays are out of the question for me - people actually sleep (or hire others) Friday night to ensure a spot. Farmers market days (Mondays, Wednesdays, Fridays and Saturdays) probably have the most traffic, but of course it's more difficult to get a spot. On Tuesdays, Thursdays, and Sundays, vendors have the whole place to themselves and it's a wonderful vibe." Lu went on to say that she realized after a few times of doing the market, that she did not need to arrive at 7:00 a.m. on non-farmer's market days, and that forming relationships with some of the "regulars" helped her squeeze in between vendors some days. 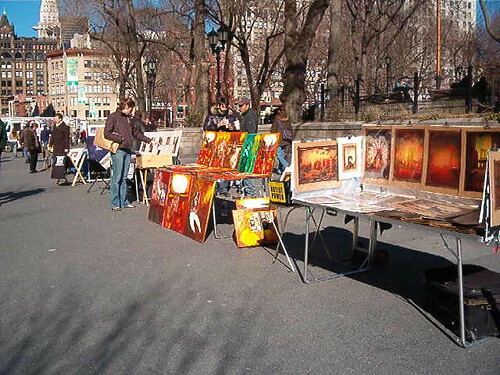 What can you sell in Union Square? Non-functional art or items covered under the freedom of speech act means that political tshirts are ok, jewelry without words is not. As Lu told us: "This seems to be loosely interpreted but I have seen some people be asked to leave for selling unauthorized items." A street vendor's permit is not required, but you will be asked to show your certificate of authority (tax permit) by park officials. 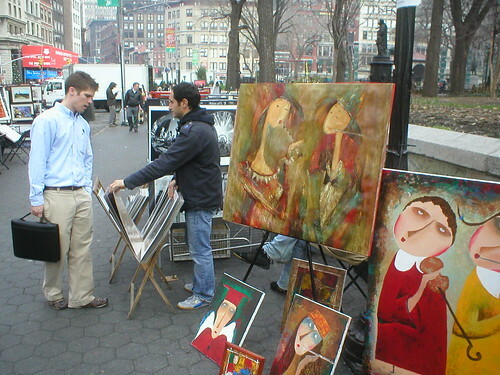 How much art can you sell in Union Square on a busy day with thousands of people walking by your work? Lu told us she has always been very happy with how she has done--and points out that not having to pay for a space is great! 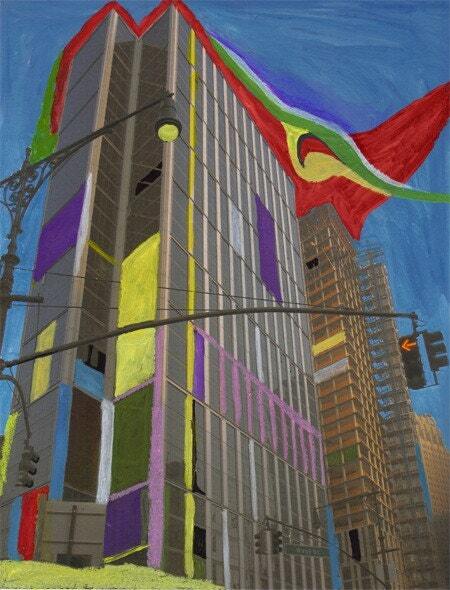 So if you are in Manhattan, check out the Union Square arts scene. But remember - you don't have to leave the comfort of your home to buy fine art thanks to Etsy. As Iris says: "Original fine art is generally considered to be an 'elitist' market for the very wealthy. However, with the onset of the internet, so many possibilities are available that weren't there before! Everyone is able to purchase, enjoy and support the arts. Artists can support themselves throughout their development and study, interact with collectors and receive feedback. The possibilities are vast and amazing!" 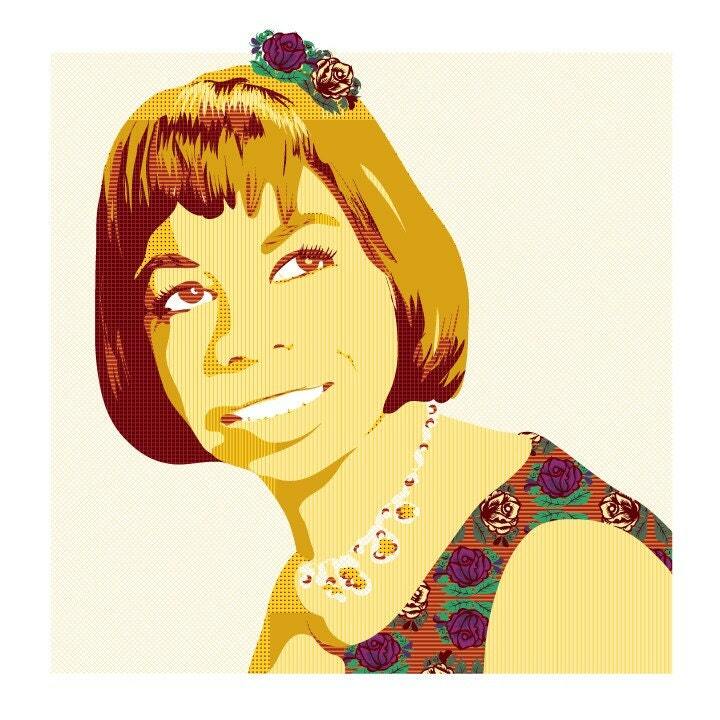 Today's giveaway comes from Lisa's shop Prism Pop and is this fabulous 12x18 limited edition Nina Simone poster. Lisa's love of music and pattern brought forth this great portrait. It is 100% her own design - illustrated by hand using the wacom tablet and her trusty mac. Lisa only prints on 100% recycled paper with soy inks - she loves art, but adores the environment too! - Twittering, blogging, or facebook mentions of this giveaway get you additional entries! Please include a link in your comments! 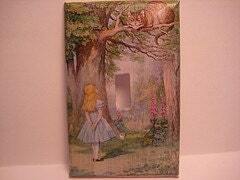 - Winner chosen at random and announced on this blog on Thursday, March 18th. Lisa will also give 1-2 RUNNERS UP a prize as well- some postcards from her shop! Have been a blog follower for some time :) My favorite item in Lisa's shop: BEETHOVEN portrait. 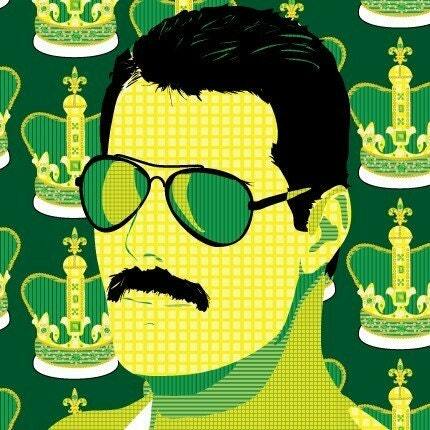 Really, really amazing way to capture his spirit. I love the pet portrait too... then again I guess I am biased. It is my dog!